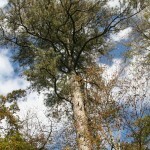 Conifers belong to the group of trees classified as gymnosperms, which are cone-bearing seed plants. 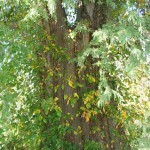 Most conifers are trees but there are also a small number of shrubs. 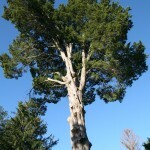 Conifers include cedars, cypresses, firs, junipers, kauri, larches, pines, hemlocks, redwoods, spruces, and yews. 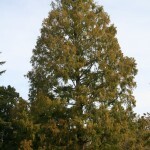 While many conifers are evergreen, a few are deciduous, meaning they lose their leaves in winter. 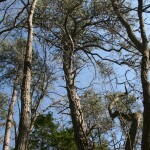 Conifers dominate large areas of land on Earth, particularly the forests of the northern hemisphere. 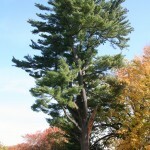 First appearing around 300 million years ago, conifers evolved biological features such as wind-based pollination and the unique ability of their needles to retain moisture and reduce water loss. 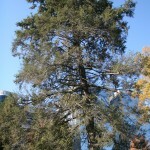 Many conifers are able to survive harsh winter conditions because their conical shape and downward-sloping limbs help shed snow. Conifers also can adjust their internal chemistry to resist freezing, a process called “hardening.” The world’s conifer forests constitute the world’s largest collective carbon sink and therefore help to make our planet a better place to live. 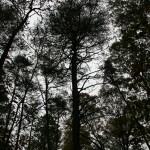 Conifers also hold tremendous economic value, primarily for timber and paper production. 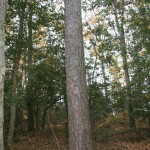 The wood of conifers is known as softwood.